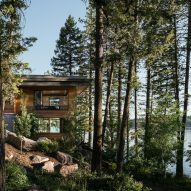 This waterfront property by US studio McCall Design and Planning is built into rugged granite boulders that face Idaho's Payette Lake. 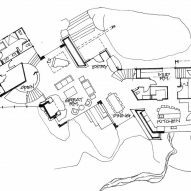 The five-bedroom Cliff House is named for its placement on a steep slope in a wooded area. 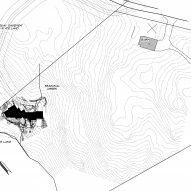 The design was informed by the natural context, which helped determine the layout of the home's three levels as they step down the hillside. 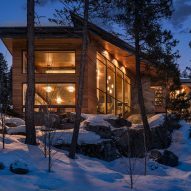 "The stepping of the site to the lake drove the design towards horizontal layers, creating a strong sense of grounding into the site," said Idaho-based firm McCall Design and Planning in a project description. 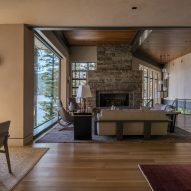 Entrance to the wood-clad home is on the middle level, into an open vestibule that leads to the dining area on one side, and the living room on the other. Floor-to-ceiling windows wrap around this space, providing the main social areas with expansive landscape vistas. The zig-zagging outline of the plan means that these rooms benefit from double exposures to the wooded scenery, making them feel "as though you're outside", according to the architects. 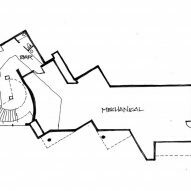 Just off the dining room is the kitchen, which feels separate due to a change in the plan's orientation. 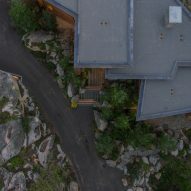 From this area, residents can access outdoor spaces carved out of the site's rocky topography. The other end of the main level is occupied by the master suite, which the architects describe as a "sophisticated treehouse for grown-ups". Its low wooden ceiling is meant to contrast the wide panes of glass that occupy two full walls of the space. 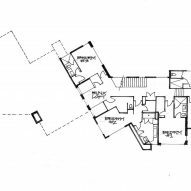 From the living room, a circular stair leads down to the den, where the architects laid out a bar and game room. An exposed boulder is visible here, reinforcing the connection to the site. 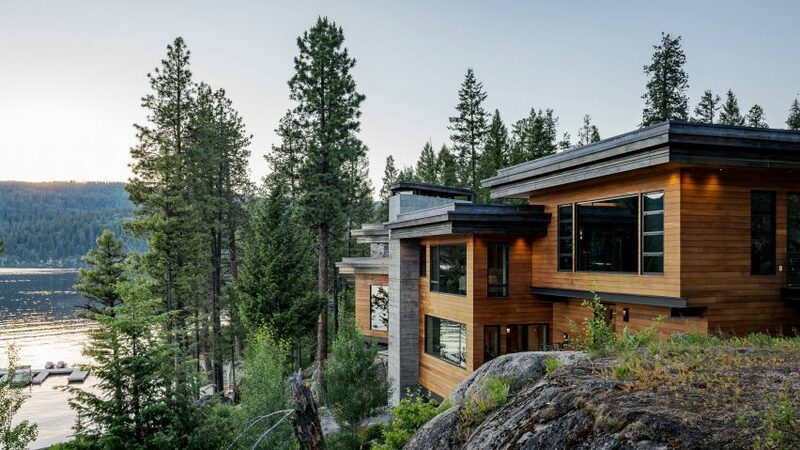 "Staircases were treated as sculptural elements, floating above existing and introduced rock elements," said McCall Design and Planning. "The flaring circular staircase to the game room was built using I-beams bent in Seattle after a full-scale mock-up was created on site in wood." The topmost level of the home contains several bedrooms for guests and children, as well as an exercise room. According to McCall Design and Planning, the original scheme had a more traditional appearance. The home's modern outcome was the result of several design iterations. "Time allowed the design team to try just about every roof form possible, before settling upon a flat roof that integrated the house into the site the most successfully," the team explained. "As time passed, the clients warmed up to a more contemporary direction with the architecture and finishes that were in keeping with their desire for a lot of glass." 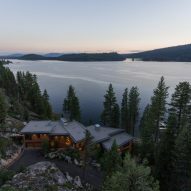 Idaho's remote landscape is a popular setting for vacation homes and secluded retreats. 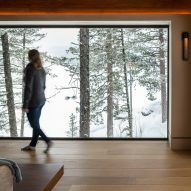 Other residences in the US state include a property lifted on stone walls by Ro Rockett Design, and a house by Olson Kundig that includes a variety of automated features, such as pivoting doors and moveable light fixtures. Photography is by Gabe Border.